"Flowering cherry tree in front of as Founders Hall, about 1973." 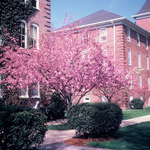 by L. Michael Hill Ph.D.
Flowering cherry tree in front of as Founders Hall, about 1973. The “pedigrees” of most ornamentals, woody or not, are often difficult to determine. This is a double flowered variety of Prunus (Rosaceae) in front of what was then known as Founders Hall. Wardo Hall, at that time a boys dorm, is visible to the right, about 1973. Founders and Wardo are now brought together as Flory Hall.